This Large Calendar Wall Clock is the ideal wall clock for those people who suffer from limited or impaired vision and who need a simple, clear, easy to read wall clock that displays both the time and the date. This clock features inch-high letters which are written in high contrast black-on-white to aid those with poorer vision and also to facilitate use by those who suffer from memory problems or dementia. 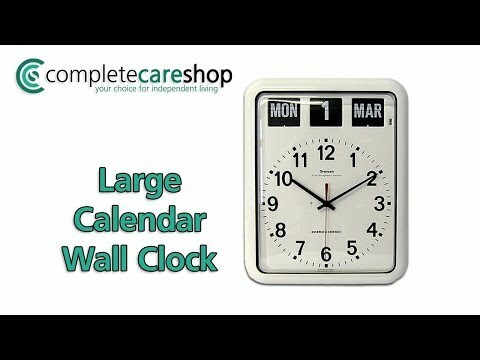 Calendar clocks for dementia patients are an excellent addition to any environment and help users to avoid confusion or anxiety. This Large Calendar Wall Clock is completely self-adjusting for those irregular days in the month and has a high precision quartz battery movement to ensure an accurate time reading. The clock itself has a tough white plastic case and is very easy to affix to the wall, making it ideal for care environments. This clock is supplied with a screw and wall plug for easy fitting and is also supplied with the 1 x AA battery required for operation.